Futuremed's new P8000 Power is a unique instrument that combines resting ECG, exercise stress testing and spirometry in one compact, light weight and economical package. P8000Power owners can start with a basic ECG and gradually upgrade its features. The P80 Six ECG generates letter sized (8½x11") reports that are truly full page with no folds or breaks in the middle at the push of a button. This simple ECG has multiple digital filters to ensure sharp, easy to ready tracings. It is available with measurement and diagnosis software. The economical EZ-3 provides 3 channel tracings of 12 simultaneous leads. It is available with or without interpretation. 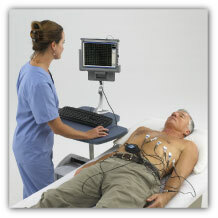 Universal-ECG turns a standard computer into a 12 lead electrocardiograph. Customizable full page reports, on low-cost plain paper, are printed thorugh your standard Windows® compatible printer. Available for under $2,000 with Measurements & Interpretation Software.